You can have bathing fun in the “3 Seaside Resorts” not only in the Baltic sea, but also on the other side of the dunes in the Baltic Sea Thermal Bath. 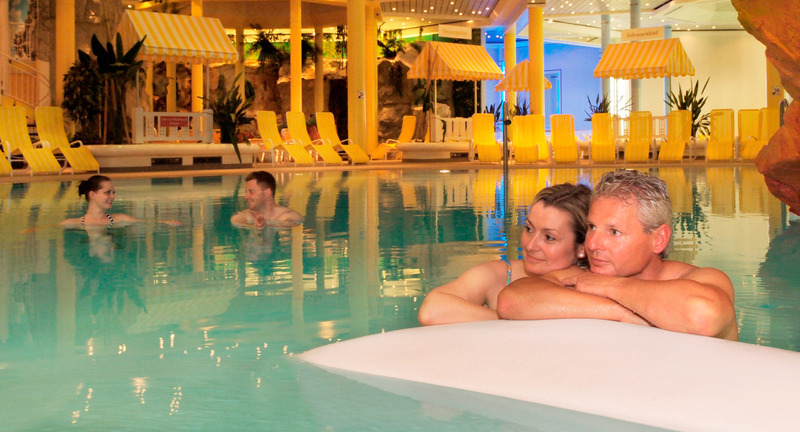 The Bathing World in Ahlbeck is waiting for small chilblains the whole year long with comfortably warm thermal water. Many people swear by bathing in thermal water and by the healthy influence of salt and iodine, which make your skin look prettier and increase your well-being. In the Baltic Sea Thermal Bath there is the 4% iodine brine, which is being extracted from a 408m-deep well very close to the Heringsdorf pier, and it is included in every pool. There is a very big choice of altogether six pools inside and outside the building, water cave, big slides, massage nozzles and a water garden with animals, which small children can climb on. End even the smallest guests can splash about in the baby pool. If you like a hot climate you can sweat out your everyday-stress from your body and soul in different saunas, from the bio sauna to the infrared sauna or from the 80°C sauna to two Finnish log cabin saunas in the outside. In order to cool down you can use the bucket shower, you can have a swim in the outside pool or dive in the ice water pool. It is also possible to spend here a day of pampering by booking different spa packages. Flowers foot bath, salt water compress, milk bath, for gentlemen a beer bath, Balinese spa, or maybe brine exfoliation? They all do vitalize you, and they are very relaxing for sure. Special brine administration in the medical area is being offered in the health resort house in the form of different treatments. It’s used for skin diseases, illnesses of the respiratory tracts and locomotor system, and many others. With these types of treatments a referral from the doctor is required, because these are special forms of the medical rehabilitation. The therapy with the iodine brine includes bathing, washings, inhalations and water curs. In the fitness studio of the Baltic Sea Thermal Bath there are many pieces of apparatus waiting for you, as well as a rich classes programme, both dry and wet courses, which will help you getting and remaining fit. Qualified trainers will draw up an exercise plan and will motivate you to seek to your goals.